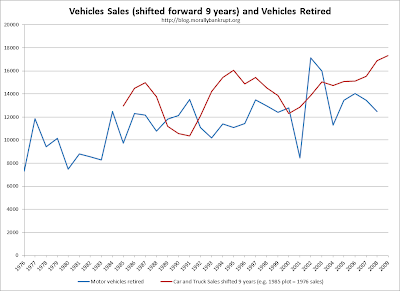 To spot longer trends in fleet growth and age, we can look at the long-term chart of sales per driver, and new vehicles as a percent of the existing fleet. ﻿ ﻿As you can see the number of vehicles sold per driver in the country every year has been declining for many years, with an especially pronounced drop coinciding with the recession that officially began in January 2008. Other sharp drops can be observed in the early 1980s, a period in which the country suffered two recessions and Paul Volcker's monetary tightening raised the prime rate to over 20%. Please note that 2010 is absent from this graph as I did not feel comfortable using an extrapolation of the current year due to choppy sales and the large weight of December in the seasonally adjusted numbers. As sales numbers become more clear (probably following the November 2 release) I might update this to show 2010. 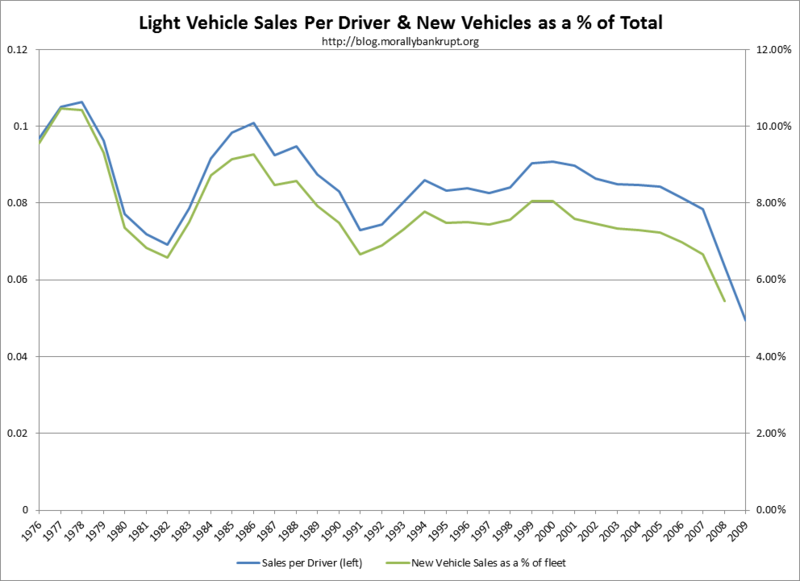 Looking at the number of vehicles sold as a percent of the fleet, it is easy to see that the measure has been in a long-term decline by the incremental widening from the sales-per-driver figure. 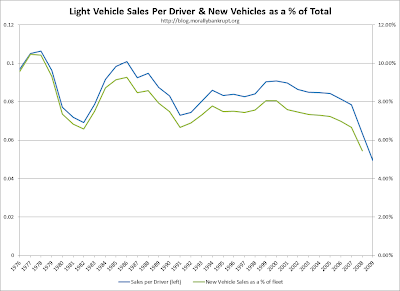 The decline in the number of new vehicles as a percent of the total number of registered vehicles seems to indicate two things, increasing mean age for the fleet, and a growing fleet. I expect the growth in size of the fleet to eventually stabilize and follow the growth in drivers relatively closely, although it is not clear if we have reached that point yet. I expect the age of the fleet to stabilize as well, even if new innovations and better quality increase the lifespan of automobiles. 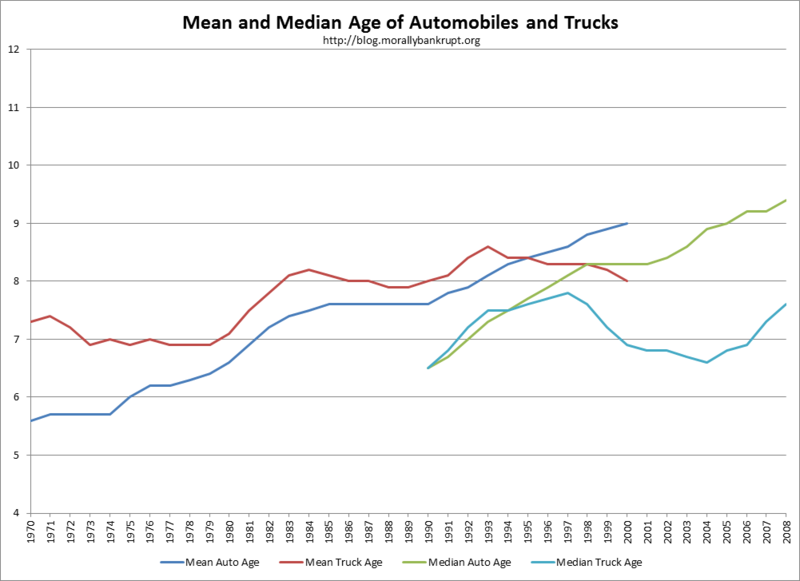 Illustrated above is the mean-age as reported by the FHWA in 2000 and the Bureau of Transportation Statistics' median age figures. 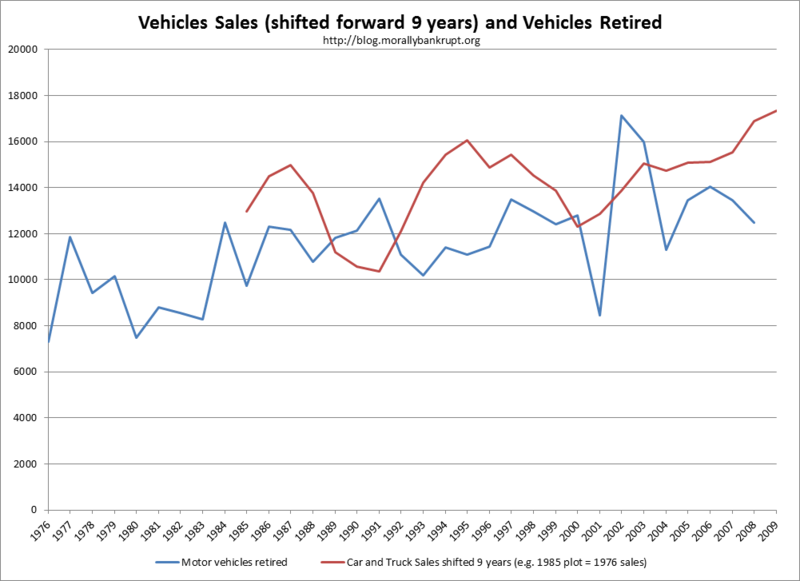 These both seem to indicate a trend of increasingly longer replacement cycle in automobiles and trucks, although one can make no conclusions as to whether it is because of improvements in quality or because consumers are less likely to replace vehicles for newer models due to economic or other reasons. Eventually, as (if?) the growth rate of the fleet and the mean age of the fleet stabilizes, I would expect new vehicle sales as a percentage of the total fleet to stabilize at a slightly higher range, too. The approximate number would be based on the average lifespan of a vehicle, the expected demand from obsolete vehicle replacement being something loosely resembling the number of sales of n years ago, "n" being the average lifespan of a vehicle. I say "loosely" because economic conditions can alter the replacement cycle for consumers in the interim. After all, every car sold (except for a few classics and collectors items) will eventually be retired. 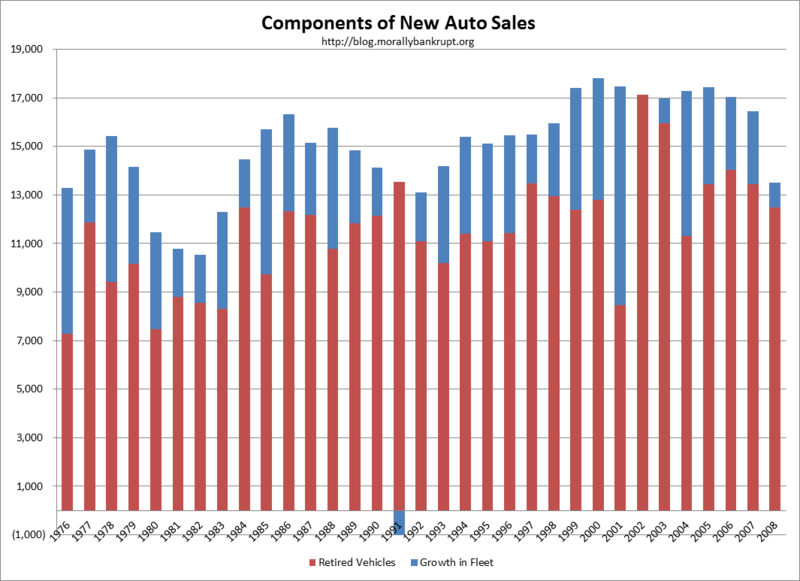 ﻿For this chart, I shifted sales by nine years to try to get a better idea of the life span of vehicles. My formula, while subject to quite a bit of noise, seems to serve as a reasonable starting point. 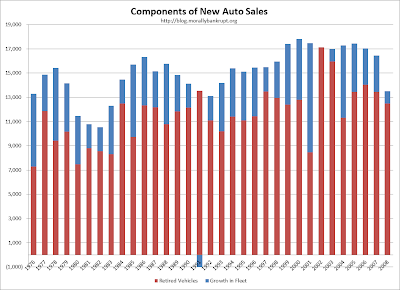 The chart illustrates the number of vehicles retired in any given year versus the number of vehicles sold 9 years prior. If a vehicle's average lifespan is about nine years, you'd expect to see similar trends and overall figures in the number of vehicles retired and the sales numbers for nine years before. The chart is subject to volatility and sales from economic cycles, but looking at the whole picture indicates that an 8-10 year lifespan estimate is not unreasonable. Data for the years 2009 and 2010 is not available yet, but we know that 677,842 cars were scrapped as part of the Car Allowance Rebate System (aka CARS / Cash for Clunkers). 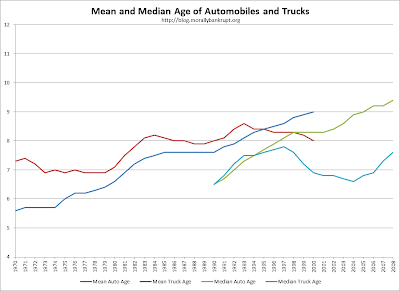 Considering the total stock of cars and trucks (excluding motorcycles and buses) in 2008 was ~240 million, there is little reason to think it significantly altered the number of cars retired and replaced. If I had to put my hand in the fire, I would wager that most cars retired as part of Cash for Clunkers would have been retired even without the rebate. It was like a dream when me and my girlfriend had an amazing long drive in my car because of commercial tires and she looked into my eyes and said that she loves me! Thanks for the beautiful date!